Qatar is one of the richest countries in the world, albeit small. This explains the fact that there is the high-quality communication. The top quality Internet, mobile and fixed telephony are available practically everywhere in cities like Al Wakrah, Doha, Al Khor, Al-Ruwais, Al Huvayr, Umm Bab, Dukhan, and Umm Said. For this reason, many terminators are interested in this direction. Picking up the best business VoIP solutions, the entrepreneur can make good money in Qatar. As of 2016, the country has a population of about 2.4 million people, having more than 4.4 million cellular connections in 2015. That is, the mobile penetration rate is more than 183%. Two GSM-operators Qtel (aka Ooredoo) and Vodafone represent the mobile sector. Qtel is a local provider, while Vodafone is the international company. Ooredoo is the largest operator in the local GSM-communication market. Its subscriber base has about 3 million users. GSM-operator Ooredoo offers its prepaid customers four packages: Hala, Hala Smart, Hala Standard, and Big Hala. The most favorable Ooredoo package for the VoIP solutions for small business is Hala. It will cost you $2.75. Vodafone, in turn, provides more than 1.4 million connections. Vodafone offers 8 packages of the Prepaid series. The cheapest one is the QR tariff plan. The required amount of top-up is $5.49, while the cost per minute of conversation is as little as $0.183. There is a prepaid package called QR 55, using which the price per minute of conversation will be $0.092, with $15.10 to top up. You will have to pay a bit more - about $0.549 per minute if you buy the QR 100 Vodafone package. But this tariff plan provides additional 50 local minutes free of charge. Using Prepaid QR 150 Price, a minute will cost you as little as $0.373. Here you can get another 80 local minutes. 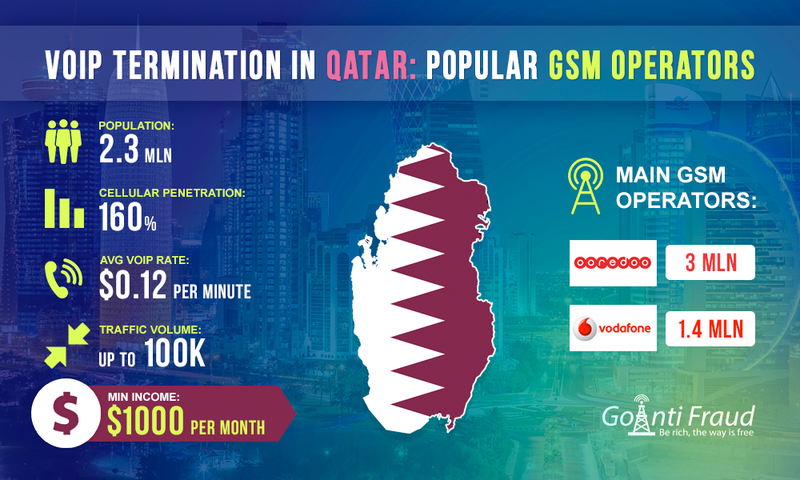 With an average value of voip communication $0.13 a minute in Qatar, it makes sense to use QR 55 e that provides the most optimal tariff for local calls. By placing gateways in one or more cities in Qatar, you can successfully make $1,500 and more. However, the operators, especially Vodafone, utilize a very powerful AntiFraud. And it is fraught with the blocking of SIM-cards. To increase your income ten times and save on the purchase of new numbers, it is important that you connect to GoAntiFraud.